Excessive clenching or grinding of the teeth, is called bruxism, and is thought to be caused by physical or psychological stress, or a sleep disorder, which can lead to painful symptoms and lsevere dental problems. If untreated, bruxism can cause excessive wear of the teeth leading to permanent damage of the teeth and sometimes of the jaw joints. Chronic teeth grinding can cause headache, earaches, facial pain, and migraines, and waking up with a sore jaw.. Dental issues include loss and wear of tooth enamel, tooth sensitivity, and flattening and chipping of the teeth. The size of the jaw muscle can also increase due to tooth grinding and overuse of the jaw muscles which can lead to the a square looking jaw. Treatments involve repairing worn or damaged teeth with restorations, crowns or inlays, to replace the damaged tooth surface, and making an occlusal splint, or night guard, custom made from hard plastic that fits over the top teeth, and is worn at night to prevent further wear of the tooth surfaces, and to allow the jaw joint and muscles to relax. Disorders of the jaw joint, or TMJ (temporomandibular joint) are not uncommon and may lead to symptoms of pain and discomfort in the jaw called temporomandibular dysfunction (TMD) . Patients may complain of earaches, headaches and a limited ability to open their mouth. Other symptoms can include clicking, popping or grating sounds in the jaw joint, pain when opening and closing the mouth, a general tightness and pain in the muscles of the jaw, or broken teeth due to the excessive forces. Muscle relaxant injections in the jaw muscles are a proven treatment option for targeting and treating excessive muscle activity. Other treatments, such as anti-inflammatory medications and occlusal splints or night guards may not address the source of the issue. Custom made occlusal splints are able protect teeth from damage at night for teeth grinders, but they may not fully stop the painful side effects because some people continue to grind away at their splint. By injecting small doses of Botulinum Toxin Type A muscle relaxant directly into the masseter muscle (the large muscle that moves the jaw), the muscle is weakened enough to stop involuntary grinding of the teeth and clenching of the jaw. This relaxes the muscle and reduces the wear and tear on the teeth due to grinding and amage to the TMJ (temporomandibular joint) and headaches should be reduced or eliminated as well, while voluntary movements, such as chewing and facial expressions, are not affected. Although muscle relaxant injections are not a cure for bruxism, they can effectively control the uncomfortable symptoms better than a night guard for some patients. Botox used for treating bruxism typically lasts for three to four months. Periodontal disease is loss of the jaw bone from around the teeth, and ranges from gum bleeding and inflammation, called gingivitis - to severe loss and infection of the gums and jaw bone, called Periodontal disease. In the worst cases, teeth may be lost, when they become infected, or so loose that they hurt to bite on. Gum disease - or gingivitis - begins with plaque bacteria, which causes the gums to be inflamed and swollen. Gingivitis is present where there are bleeding gums when brushing or flossing, and persistent bad breath,. Progression of the disease may cause loss of the jaw bone and gum that holds the teeth in. Once the bone is damaged in periodontal disease, it is an irreversible disease, so it is critical that it is picked up at an early point for preventive measures or treatments, which can make a big difference. Prevention is by far the best treatment for periodontal disease, and visiting your dentist each six months for a complete check up and preventive care, including periodontal screening and digital x-rays each two years to look for deposits of plaque and calculus, and loss of the jaw bone, allows any dental issues to be identified, controlled and treated early. Many people with mild gum disease don’t show any symptoms, but if you notice anything different about your mouth or teeth, please tell your dentist. 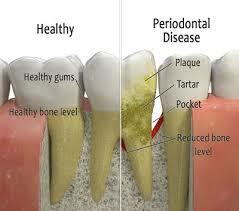 If you do have periodontal disease, the treatment will vary depending on the severity of the infection. Severe periodontal disease treatment may involve a deep cleaning procedure called scaling and root planing, in which the dental hygienist or dentist removes tartar - or calculus - from both above and below the gum line and smooths rough spots on tooth roots where plaque-causing bacteria lives and likes to stick on. Regular dental care at home of twice-daily tooth brushing and daily flossing, plus regular visits to the dentist for active maintenance and professional scaling and cleaning each 6 months, allow any problems to be picked up at an early stage. Wisdom teeth are also known as third molars, and come through in a position which is the furthest back in the mouth. They usually come through or erupt around the ages of 17 to 21. If they come through straight where they line up with the other teeth and in a position where they can be cleaned properly, it is possible that they can be kept for life. Most people have difficulty cleaning them, and food debris gets trapped up behind them, down at the gum line where the cheek fits against the tooth, or in between them and the tooth in front. A lot of people have the teeth come through at unfavourable angles, or where they cannot come through due to lack of space. DOES EVERYONE GET WISDOM TEETH? Most adults have 4 wisdom teeth, and some people have these for life if they are in a good position and able to be cleaned properly. Some adults have less than four. If the teeth stay buried in the gum and bone, termed impaction, they may be a source of infection at a future date, especially if they allow bacteria to get stuck under the gum, and in this case it is prudent to consider removing them. CAN I KEEP MY WISDOM TEETH? If the wisdom teeth are in a straight position, lining up well, being used in the bite, and able to be cleaned properly, they can be kept for life. It is important that just like any other tooth, that they are checked and cleaned professionally, to ensure that any early issues are tended to. If the wisdom teeth are affecting the other teeth as they develop, the dentist may recommend that they are removed. Generally there is a lack of room when wisdom teeth come through, so they are at risk of periodontal disease and cavities. Less than 2% of people over the age of 65 are thought to have been able to keep their wisdom teeth in a healthy state. It means that the wisdom tooth is at an angle where it is trapped by the tooth in front, or covered with gum or bone, where it can't come through properly. HOW CAN I TELL IF I AM USING MY WISDOM TEETH? To be able to bite, there has to be a top and bottom tooth that line up. We call this occlusion. If there isn't an opposing tooth, we call this non functional, meaning the tooth isn't being used. We then have to ask ourselves about what the point is in keeping a tooth that isn't being used. If the tooth isn't lining up properly or leaning at an angle, it is likely to cause food debris to get trapped around it, which can cause infection if it is not removed promptly. WHAT HAPPENS IF I JUST HAVE ONE WISDOM TOOTH OUT? The opposite tooth can grow down to try to find a spot to meet something to bite on. Sometimes it will drift down out of the line of the other teeth. This is called overeruption. It causes the tooth to sit at an angle to the tooth in front so there is a space where food debris is more likely to get stuck in between it and the tooth in front. It can also change the bite. If a wisdom tooth is removed, usually the opposing wisdom tooth (the one above or below it) is removed, because they are in a balance. CAN WISDOM TEETH MOVE OTHER TEETH? This is an area of differing opinion. When braces are used, they apply pressure to the teeth to move them to an ideal spot. The same pressure is likely to be caused by a wisdom tooth that is stuck in the bone and pushing up at the teeth in front. It is possible though that teeth can move without any wisdom teeth. The teeth aren't cemented in the bone, so they can drift and move. The only way to really stop the teeth from moving is to have a bar put behind the teeth that are moving to physically prevent them from drifting, termed a retainer. These are usually bonded in by your dentist or orthodontist and consist of a metal bar that is bonded to the teeth. DO I NEED TO HAVE A GENERAL ANAESTHETIC TO HAVE WISDOM TEETH REMOVED? The most important part of determining if wisdom teeth are complex is to look at them clinically. 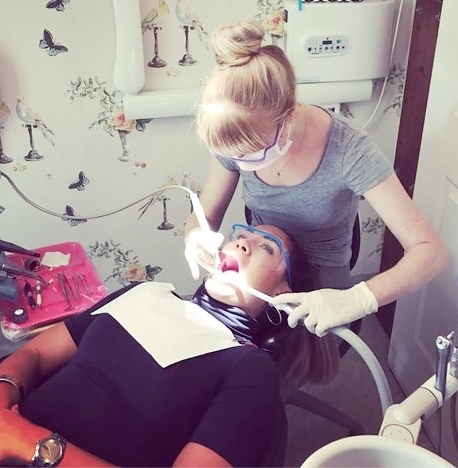 If most of the tooth can be seen in the mouth, then it is might be possible to have them out with a local anaesthetic in the dental chair with the dentist. All dentists and specialists will request an OPG, or full jaw x-ray to determine where the wisdom teeth are lying in relation to critical structures, like the sinuses, and the nerve that supplies the lower lip and lower front teeth. An OPG xray will allow the dentist to find out where the roots are lying and whether there is any risk of losing nerve sensation, and whether there will be complications. WHAT DOES THE OPG SHOW? An OPG shows all of the teeth, the jaws, and lower facial structures. The lower wisdom teeth root structure is analysed, and the distance that the root tip is located from the inferior dental nerve, the nerve that runs through the jaw bone to supply the lower lip and front teeth, is measured. If it is less than 3mm away from the nerve, the dentist will ask you to see an oral surgeon. This is to give you the best chance of avoiding damage to the nerve, termed paraesthesia. There are some people in the world who have lost sensation in this nerve due to removal of wisdom teeth, so it is critical for your dentist to analyse this. The upper wisdom teeth are analysed as to their root formation, and their distance from the maxillary sinus. If they are positioned inside the sinus, this can cause immense complications, and require a referral to an oral surgeon. HOW LONG WILL I HAVE TO TAKE OFF WORK? This really depends on how the teeth are positioned. If the tooth is able to be reached to remove it without uncovering it from the gum and bone, the healing will be much more straightforward. If the tooth is buried inside the bone and needs to be uncovered, the healing will take longer. In general, we call people the next day and they are ok, for a single wisdom tooth removal in the dental chair. A dry socket is where the gum and bone healing is delayed or disrupted. An appointment will need to be made with the dentist to place some medicine into the areas where the tooth came out, called the socket. Warm salt water rinses can soothe and settle the inflammation and help to cleanse the area. People who are more prone to dry socket are diabetics, people who have lower immunity and smokers. 2. Don't poke anything into the area or do anything to dislodge the blood clot in the area where the tooth was removed. 3. Chlorhexidine mouth rinse 3 times a day, to decrease the bacterial count, such as Savacol or Curasept. Curasept is favoured by dentists because is has non tooth staining technology. 4. Don't go for a run or do anything that might raise the blood pressure and cause bleeding from the space where the wisdom tooth was removed. 7. If intense pain develops in the area, the dentist will flush out the socket with Chlorhexidine and place a specialist iodine based dressing. WHO IS AN ORAL SURGEON? An Oral Surgeon is someone who has trained to be a dentist, a doctor, and oral and maxillofacial surgeon. They have extensive experience and training in removing teeth, placing implants, and facial reconstruction and surgery. Wisdom teeth are thought to have been helpful to our ancestors, who had larger jaws, to grind down plant tissue. With agricultural progress, human diets became softer and it is thought that there was less forward growth of the jaws, than that in our ancestors. There is some historical evidence of a woman with an impacted wisdom tooth in the year 10 000 BC, so it is not entirely a modern issue. WHAT ARE THE WISDOM TEETH CALLED? The wisdom tooth on the top right is called 18. The wisdom tooth on the top left is called tooth 28. On the lower left, it is termed tooth 38, and on the lower right it is termed tooth 48. When dentists talk about wisdom teeth, we called them the 8's, because they are the 8th tooth from the front. WHAT AGE ARE WISDOM TEETH ASSESSED? In general, it is possible to estimate if a wisdom tooth is in a reasonable position by the age of 23. It is unlikely for a wisdom tooth to change a lot after this. If considering removal of wisdom teeth, it is recommended that this be done prior to the age of 25, because the bone becomes denser and there is an increased chance of infection. DO ALL WISDOM TEETH HURT? The lower wisdom teeth will often be uncomfortable around the age of 19 or 20 as they are coming through. There is a gum flap at the back when they erupt, and sometimes debris gets trapped underneath this and causes the area to become inflamed. Generally this is because debris is trapped around the wisdom tooth, in between it and the tooth in front, or underneath the gum flap around the tooth. Flushing this out with warm salt water rinses and thoroughly brushing the area, may help to soothe the area. WILL ANTIBIOTICS SETTLE THE WISDOM TOOTH? If the wisdom tooth is extremely bad inflamed, causing general sickness and fever, then maybe antibiotics will be prescribed, but it masks the underlying cause of the infection. Antibiotics are a last resort, because their overuse is causing a worldwide problem with no antibiotics left for life threatening illnesses. WHAT IS THE BEST WAY TO CLEAN WISDOM TEETH? An electric toothbrush with a pressure sensor and timer and a small soft head will allow thorough brushing at the back and edge of the wisdom teeth, where a regular toothbrush may not fit. The electrical motion generally allows movement at the back and cheek side of the teeth, where it might not be able to be accessed or manoeuvred well with a standard toothbrush. Flossing in between the wisdom tooth and the tooth in front is important to remove the bacterial film that gets trapped in between the tight areas where the teeth meet each other. This is an area where debris and particles like to sit and cause problems if they are not regularly removed. It also contributes to bad breath. A water flosser can be very helpful to kind of blast away the bacteria that sits at the edges of the teeth.